Fly Casino has Age of Egypt online slot game! 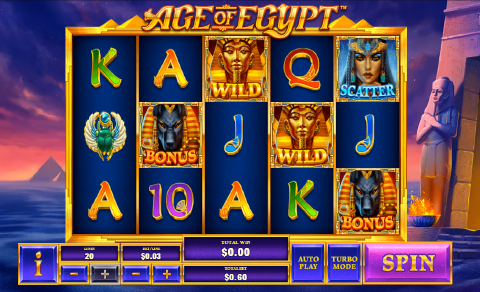 This 5-reel, 20-payline game plays with classic A-K symbols, scatters, wilds and everything ancient Egyptian. As you would expect with an ancient Egyptian themed slot, you are seeking treasure and this new game at Fly Casino offers you a chance to find your treasure through two great bonus features. New Game Bonus! On Sunday from 00:00GMT until 23:59 GMT, all members on their first deposit of just $/£/€30 or more will receive a 60% bonus up to 240.00. Claim 2X. 100% Play Day! From 00:00GMT until 23:59 GMT, all members on their deposit of $/£/€30 or more will receive a 100% bonus up to $/£/€100.00.